What Does Your Community’s Social Economy Look Like? What if you convened a group as diverse as codefest winners, giving circle donors, librarians, start-up leaders, and fundraisers? And what if you asked them to describe all the ways they spend time and money for the public good? On the second day, Lucy met with a group of about 36 people who mostly work outside of the traditional grantmaking world. Many met each other for the first time, and we missed the voices of about 50 more invitees who weren’t able to attend. Lucy’s slide deck from the conversation is at http://www.scribd.com/doc/212758822/Social-Economy-Digital-Civil-Society-Bernholz. Lucy asked the attendees to list and post: 1) all of the actions they took for the public good, and 2) all of the groups through which they took those actions. A majority of the attendees listed volunteering for a nonprofit organization, many serving as board members. A majority listed donating financially to causes. Those traditions remain strong, even with the younger attendees. But, only about half of the activities listed were in the nonprofit sector and the attendees used the word giving without regard for receipt of a charitable deduction. A larger picture of philanthropy (defined as “voluntary action for the common good”) emerged to include social enterprises, political activities, and the uses of crowdfunding sites. The group also made a clear connection between achieving the common good and taking such actions as: buying a farm share, using sharing services such as Lyft and Airbnb, participating in Meetups, and activating their social networks for causes. They described how those actions built stronger relationships, trust, and sense of community (translated for grantmakers – “community building and social capital outcomes”). What Does This Mean for Pittsburgh (or your City)? Act together? 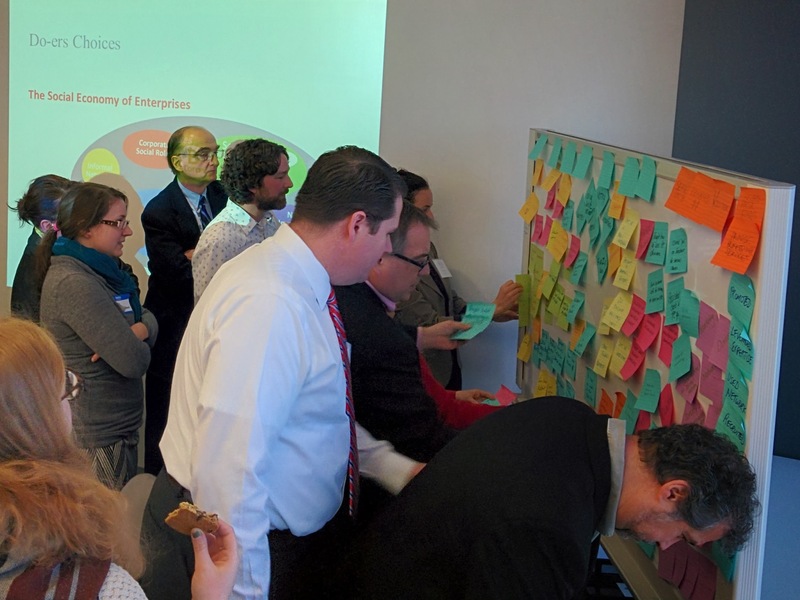 – Will traditional philanthropy associations such as Grantmakers of Western PA successfully include this broader set of social good doers? Or are those associations so dominated by large funders and “grants as the main tool” thinking that others won’t feel welcome? Will an alternate set of social good associations (or meetups and/or political action groups…) rise up around regional grantmaker groups? Lead together? – Many of the attendees will likely become the next generation of community leaders. Could they become the next leaders of foundations and corporate giving programs? The legal structure of foundations has proven adaptable to forms of social good such as impact investing and grassroots grantmaking. But will the culture of professionalized philanthropy be ready for people who effortlessly deploy the full array of social good tools? Grow together? – Groups of funders in Pittsburgh and many other cities have built capacity-building resources for 501(c)(3) public charities. Will they build similar resources to provide free and discounted management assistance, legal advice, tech support, and more to B-Corps, unincorporated groups, code for good groups, and more? And can funders build those resources in ways that don’t force those groups to follow the rules of 501(c)(3) land? Conversely, how will communities help nonprofits effectively adapt to the broader social economy and collaborate with these free agents on community problem-solving? Know and learn together? – Lucy talked about the absence of a national conversation around the ethics, rules, and regulations of digital public goods – information produced and shared by charities, government agencies, and other social economy groups. The Brookings Institution has made the case that metropolitan areas, rather than nations, are now the main hubs of innovation and community problem-solving. 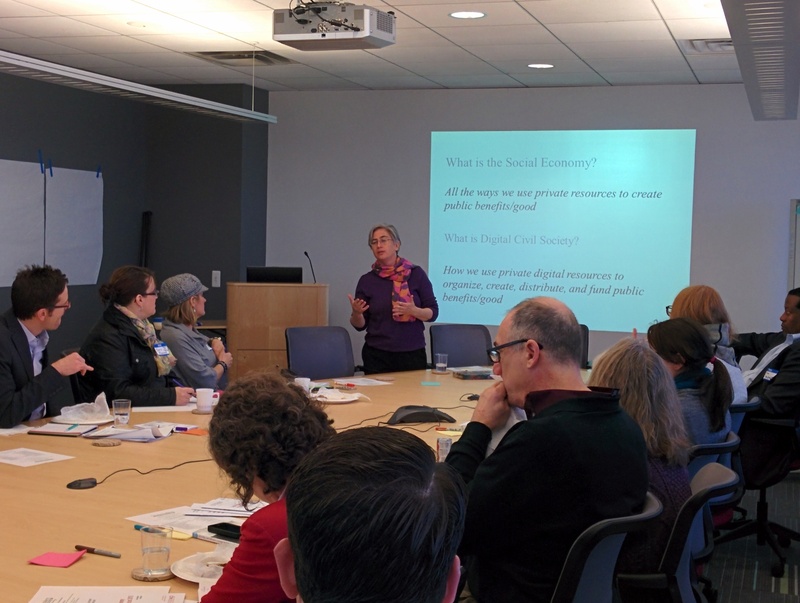 Though digital information flows across borders, could or should communities such as Pittsburgh craft their own, shared codes of conduct around digital public goods? What would a picture of your community’s social economy look like, and how would you grow that economy?